Before Christmas we held two colouring challenges one for adults and the other for children. Colour along with a Child Challenge was created and will launch today at Art by Barb facebook group. 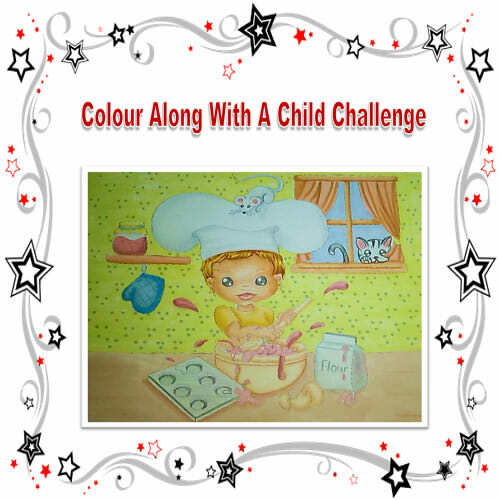 Unfortunately, I didn't have a child to colour along with me but you can visit Victoria's Crafting Creations blog to see how Vic and her daughter Tiegan coloured the image together. The free image for this months challenge is Baker line art. Available in a boy and girl version. I coloured the image with mainly promarkers and used a light grey pencil for the hat and mouse and a black pencil for the cat. Pop along to Art by Barb and read the pinned post for full details about how to request the free image and enter the challenge.